The Metropolitan Museum of Art, located on 5th Avenue in New York City, welcomes locals and tourists from around the world each day. The museum’s unique layout and beautiful galleries make crowds believe they have left New York City and have transported to an entirely different part of the world or time period as they explore. From the year 1870 to the present, the Metropolitan Museum of Art has added and organized some of the most fascinating and breathtaking pieces of art from around the globe to form one of the most amazing museums as well as a major landmark in New York City. As I walked around the museum this past weekend, the exhibit that stood out to me the most was “Public Parks, Private Gardens, Paris to Provence” which is open to viewers until July 29th, 2018. This exhibit surrounds a beautiful room of greenery that gleams in the sky light from above. As I walked into this exhibit, I felt as if I was in a secret garden. The peacefulness surrounded me as I took in every color displayed in each piece of art. 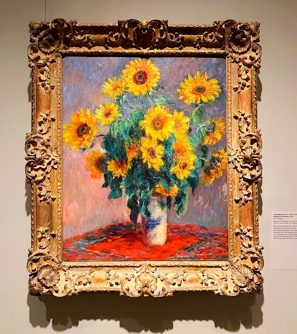 Two pieces of art in this exhibit that I specifically loved were Sunflowers by Vincent Van Gogh, and Bouquet of Sunflowers by Claude Monet. Both of these artists specialize in impressionism, which incorporates short brush strokes and vibrant colors to signify the effects of sunlight. As a young girl, I had a little garden that I took care of with my mother, and sunflowers were always our main attraction, which is why these two pieces of art were so special to me. When I looked at the two paintings, I could envision myself in my backyard with my mother, with the summer sun beaming down on my tall sunflowers. 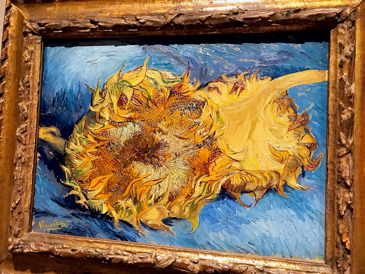 The beautiful features of these sunflowers in the sunlight are perfectly portrayed in both Monet and Van Gogh’s paintings. It truly brought me back to my childhood and gave me a great sense of comfort since being away at college, I have missed my family. Who knew these pieces of art could give me a sense of solace. As a college student, having the Metropolitan Museum of Art so close is an incredible experience that most people my age do not have the opportunity to understand. Being up close to artwork dating back to 300,000 BC is something that tourists around the world have to travel to see yet I am moments away. I feel most people take advantage of the fact that they are so close yet rarely take advantage of going to see this magnificent magical place. Historical art, as well as modern art, is something I have always loved and cherished, which is why I love to visit the museum as often as I can. I will always appreciate having this museum so close to my home. The museum is an educational yet lively place to be, and I encourage everyone to give it a visit. You never know, you may find that one piece of art that will make you feel home even if you are not.